You can now add wireless charging to your old Samsung or iPhone! You are here: GeekSays Technology News » General » You can now add wireless charging to your old Samsung or iPhone! Wireless charging is one of the latest trends in the mobile industry. After all, what’s not to love about it? You just place your phone on a pad and the battery starts charging, without the need to plug any wires. But what happens if you have an older model, without this pretty cool feature? You buy a phone cover, of course. 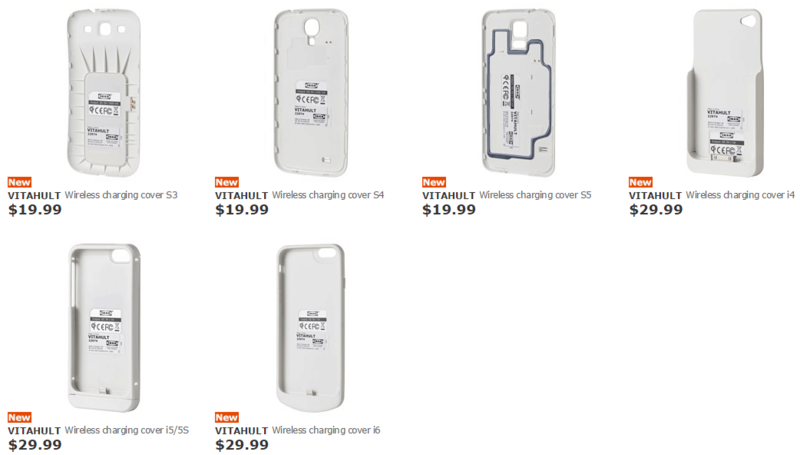 A Reddit user spotted a new set of Vitahult covers on IKEA Canada‘s online store, allowing you to add wireless charging to older models from Samsung or Apple. To be more specific, we’re talking about the Samsung Galaxy S3, Galaxy S4, Galaxy S5, alongside the Apple iPhone 4, iPhone 5 or 5S and last year’s iPhone 6. The best part is that they’re not expensive at all, a cover for your Samsung costing just $19.99, while one for an iPhone has a price tag of $29.99. The cases are also available in the U.S, being priced at $15.00 (Samsung), respectively $20.00 and $25.00 (iPhone). While the iPhone wireless charging cases look more like a case, adding a pretty serious amount of bulk to your phone, you won’t even notice the one one your Samsung. Basically, it replaces the back cover, without altering very much the size of the phone, as it measures just 0.8 cm in thickness. On the other side, due to the fact that the iPhone doesn’t have a removable back case, the wireless needs to be attached differently, connecting it to the phone through the charging port. For the moment, the chargers are available just in white, while details about availability in other colors aren’t available yet. Additionally, the retailer also offers wireless charging pads, at price starting with $39.99, which is a very good price, considering that pads made by Samsung, for example, are not that cheap. Any first impressions about this? Would you buy a wireless charging cover for your old Samsung or iPhone?